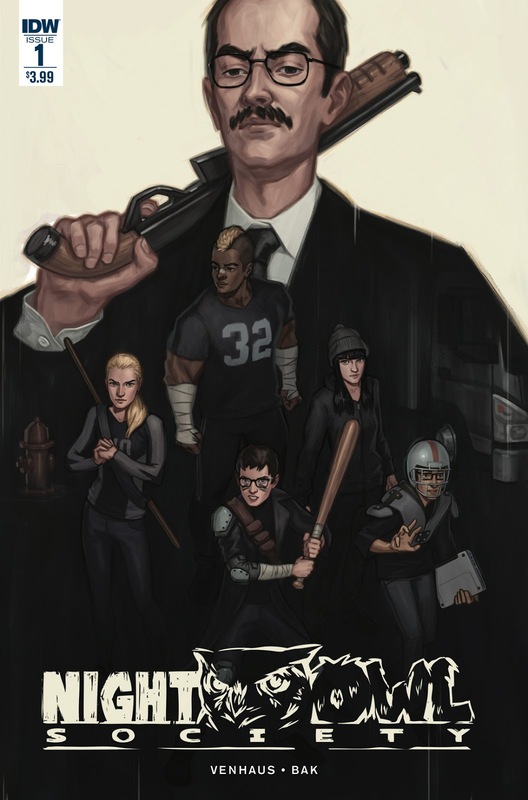 The Fellowship was fortunate enough to obtain a copy of NIGHT OWL SOCIETY #1 from IDW Publishing. James Venhaus writes, Pius Bak draws and colors, and Marshall Dillon letters. David knows what happened to Father Shawn. He knows who did it, and he knows how to take him down. And he knows that he needs help to do it. But he’s kind of a nobody at school. With a little persuasion (and a lot of introducing himself to kids who already know him) he builds a team of his classmates to wreak havoc on this local crime lord. Not to worry, fair reader, there is a twist in the tale. And boy, is it a lulu (no spoilers here, though). David is young and inexperienced, but he seems to think pretty well on his feet. And he’s put together a good team so far, and a diverse one, which really helps build a good story. The art, too, works very well to show us a group of kids starting to become a team with a common goal, doing so with use of angles and expressions (or lack of them, in some cases). There are some interesting variations on the classic revenge story here. Some cool characters, too, so definitely check this one out. NIGHT OWL SOCIETY #1 is available now from your local comic shop, or online at idwpublishing.com.